A tweet from a top Wichita city official promotes great news that really isn’t so great. 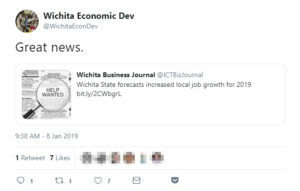 The tweet observes “great news” in a Wichita Business Journal article reporting on an employment forecast. Wichita jobs are seen to grow in 2019, according to the forecast. But the Business Journal article didn’t provide any useful context. Once we learn more about what the numbers in the forecast mean, we may want to temper our enthusiasm. Back to Rigby’s tweet: There is good news — Wichita is not forecast to lose jobs, as it has in the recent past. 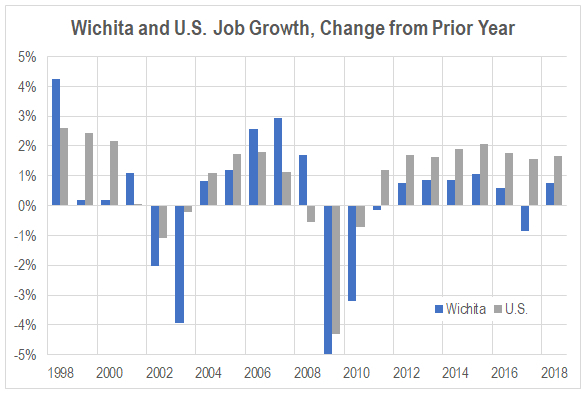 But the rate of growth seen for Wichita is not robust, and that’s a serious problem, especially when our officials think it’s good.